The "mini collection" perhaps is a haphazardly defined notion. So it goes with collector jargon. It can reflect a complete spread of a niche selection, say a 6 item hoard encompassing all the variant pens and pencils for Sheaffer Balance only the marbled blue/white color called Blue, made for perhaps just a year or so. More generally it can represent even an incomplete array of the subject of interest, linked by color, brand, model, filler, etc. Perhaps we can say it represents a focused subset, complete or not, within a collector's global collection. I've grabbed 1920's-ish Sheaffer metal pens when I've had the chance. Quality pens in a nice variety of patterns, metals, sizes and evolutionary tweaks, there are... many... varieties. I've never tried to count even the catalogued range. In my view they are somewhat under appreciated, relative at least to the attention lavished on Waterman overlays from the same era. 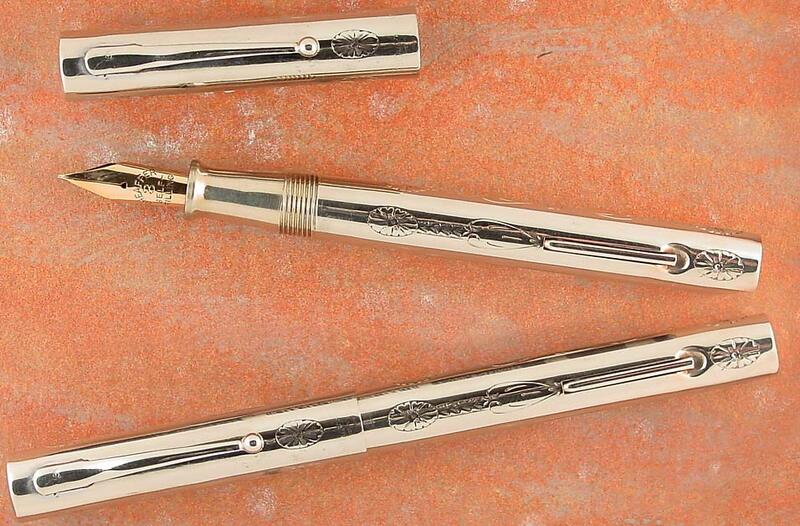 Pens are found in gold-filled, sterling silver and (rarely) solid gold. Some have metal encompassing the entire barrel and section. Others expose some rubber on the proximal barrel and have rubber gripping section. They range from wee midget pens with #1 nib to many I've seen with #3 nib in full length clip pen. I've shot one large pen in rough shape and have seen no others of that size. I've not set out to amass a complete collection. But, when I find one in nice shape at reasonable price, I add it to my collection. This is a collection that has no hard and fast goal, but seems to grow randomly, unlike some of my other mini collections. I like that. Adds some balance (no pun intended) to my approach to collecting. Especially in ring top form, these often can be found in affordable fashion. I routinely see far more in gold-filled than in silver. Trick is to watch for significant dents, brassing, and corrosion. So, in a recent spate of "quick and dirty" pen photography sans light tent, I tossed amongst other mini collections my metal Sheaffers into one of my "Peter Miller" Waterman repro trays and shot 'em. I seem to have left out one of the most interesting pens. Bad me. It is a medium size clip pen (#2 "Sheaffer Self Filler" nib iirc) in a rather uncommon basket weave pattern. So it goes. Might look to be many pens ,but keep in mind, this is nearly 13 years of casual search, indicating on average about 2 pens per year. Given enough time, that adds up. Do peek at the eye candy. What are the barrel marks on the one sterling (not the floral)? This ain't easy! From the top is 14K hand turned, "basketweave", brocaded, 14K ribbon line, filled ribbon line. Basketweave is not the name of the chasing Sheaffer calls it "distinctive chasing" code "W" which is not defined on page 17 of the 1925 catalogue. Code "L" is simply called hand turned. I finally got the last one, the hand turned, about a month ago. Great pens! This topic got me excited because it is a favorite part of my collection. I pulled some stuff out of storage and did some quick-and-dirty photos of my own. This is a big chunk of my full-size collection. I also have some medium-sized pens and ringtops. Don't have all the patterns -- or anything in solid gold -- but I keep looking. 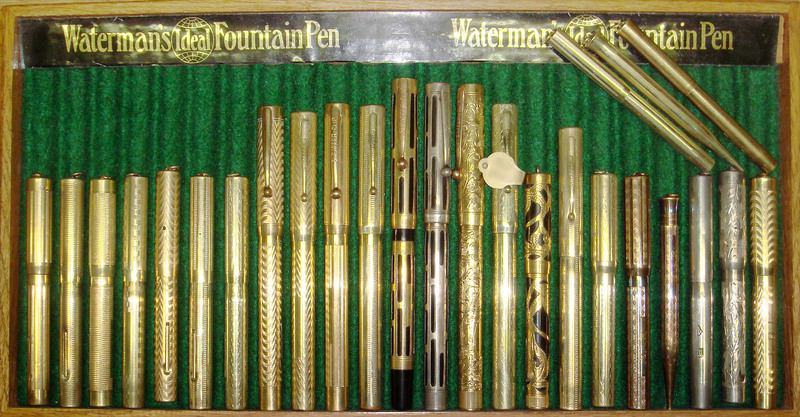 The six pens on the right (and the clipless model on top) are from the Sheaffer-clip era. The ones on the left are from later. What's not here -- because I couldn't find them quickly -- are several other slotted pens, including a medium-sized clipless. This represents about 16 years of shopping around. I think a lot more people would be excited about these pens if they saw more of them. Unfortunately, they aren't the sort of items you come across every day, especially in full size. What you see most often on eBay are the smaller pens and ringtops. If anyone ever does a good Sheaffer book, these deserve a chapter. That truly is a lovely collection. Do show more. I present to you a complete set of ringtop 1's and you can't be bothered to comment? Name how many other complete set of 1 ringtops you've seen? Really, why do I bother? You want metal pens - I'll give you metal pens! Almost all of them - I forgot at least one. Geez, Wooten. Don't hold back. Tell us how ya really feel. Not too shabby a collection btw. Thanks for sharing. Care to address if the metal pens with all barrel and section showing all metal represents different era from those with some rubber and with rubber threads/section, or different parallels styles? I'm guessing you lack this one... solid 18k? One of the special hand engraved giftie pieces. I have not persued them. I bird dogged one for a friend a few years back - I think he has three or four of this series - uber rare. It is actually 18K Palladium White gold. $37 was the cheapest pen in 1928 with your example being $55 new. There are six paterns with only three being illustrated. Sheaffer went all metal in 1925 so those are later. Marked "Made in USA" on the end of the barrel are later. I've not made a study of these as yet though, I have a few to work with. I hadn't planned to go this way -- I liked balances and triumphs and was happy collecting those. But there was something about these gold pens that pulled at me -- and still does. You might not match me pen for pen but, you are doing an admirable job at it! I really like the rare stuff regardless of size. Most metal Sheaffer's are on the uncommon side and you've some very fine examples. I really like the basket weaves and the filigrees - especially the partial overlays. Some nice material, to say the least. Certainly these collections show more metal Sheaffers than I've ever seen in one place. Here's a solid 14k. Not mine though. 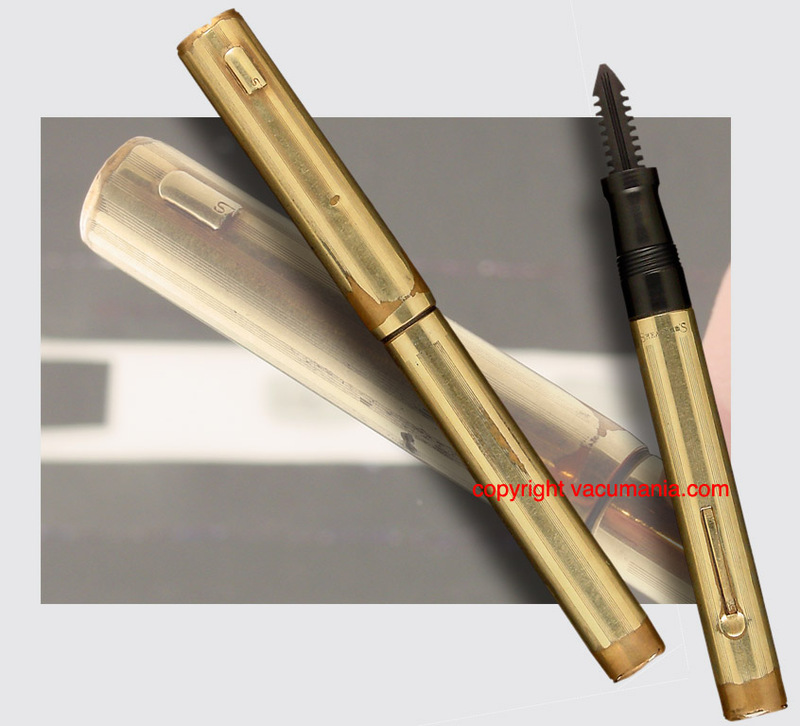 Oh yeah, and the "only known" big fat Sheaffer overlay. Roger knows where this lives. I think the fat one that I know about is in better shape though it was rough as well - has been years since I've seen it so I could be wrong. 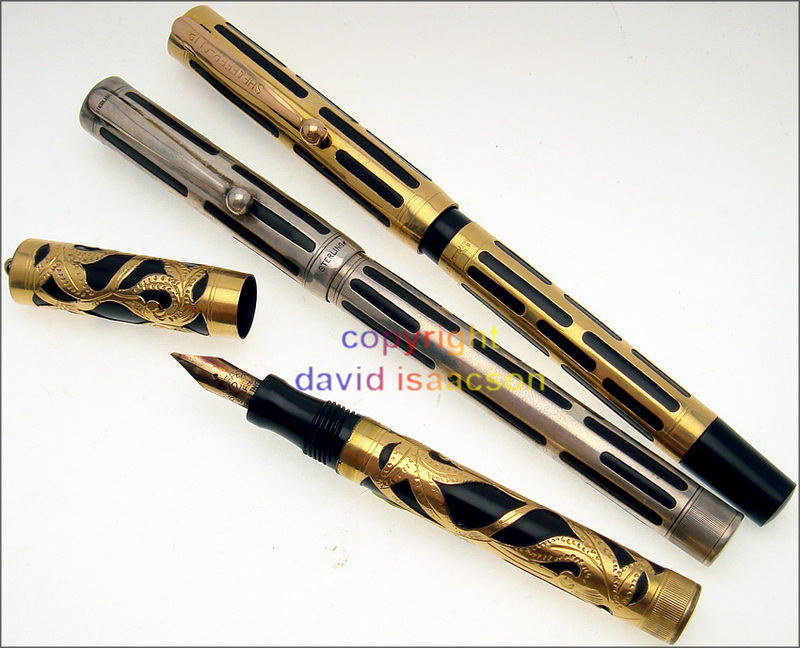 I'd say the 14K is clearly one of the six hand engraved giftie patterns and one of the three not illustrated. What is the intended implication of the scare quotes? What size nib should that "big fat" overlay have? I don't know. Pen not in hand. Handled it few years ago. Vague recollection is that it felt as if it might take a Sheaffer #6. I don't insist. It could have taken a 6 but the lifetime nib had been in use for some time and seems more likely. This pen is post 1922. Maybe this is the one I've handled - in my mind it wasn't this bad but had significant issues. I've not seen another so I assume you are correct that it is the one I am familiar with. In fact is this likely to be the 98BC from the 1923 catalogue? That's a lifetime nib in ribbon lined green gold filled. I don't argue yet on this point. Care to share for ze crowd when the Self-Filler nib gave way to Lifetime nib in all pens that size? Or how you date your metal pens? Do we know that metal pens must have taken Lifetime nibs? I've not seen a metal pen in larger than a 3 Self-Filling nib. I may not have edited my last response before you replied (it was a rambling thought) anyway, from the '23 catalogue the 98BC is roughly 10% greater in diameter than a standard 3 and is shown with a lifetime nib. So I'd say there is a class of metal pens that took lifetime nibs and that they are unusual and larger. One Ebayed a while back but I didn't get it - didn't save any particulars about it other than I noted it had the lifetime nib - some pictures don't stand out to emphasis it being really large but 10% may be hard to decern in an auction shot. Holy smoke, Roger... here I thought you were "just" the desk pen guy! (Those are totally benign quotes, by the way.) That one shot of just shy of five dozen pens is more than my entire collection (including parts pens).